When I arrived for my first job on Wall Street in July of 1983, the Dow Jones Industrial Average sat at 1,225. Despite a painful pullback in the fourth quarter of last year, this popular benchmark index now sits above 23,000. So, it might seem understandable that I should have a bias toward optimism when it comes to investing in American companies. I offer no apologies for this affliction. The last 35 years have taught me that the shares of increasingly prosperous U.S. companies get revalued “up and to the right” in an irregular fashion. I also know this isn’t a coincidence of my arrival on Wall Street, because 35 years prior, the Dow Jones traded around 180. Most U.S. stock indices entered bear market territory during the fourth quarter, meaning they have retreated at least 20% from their most recent high. Small cap stocks have been amongst the hardest hit. The table below shows this pullback as the sixth worst since the inception of the Russell 2000 Index in 1979. Not fun. With the caveat that no one can predict the future, let’s examine past periods of stock market treachery. The forward returns of the Russell 2000 Index following each of these awful time frames are exhibited on the next page. A down period for this index occurred only once during the year following the darkest hour. 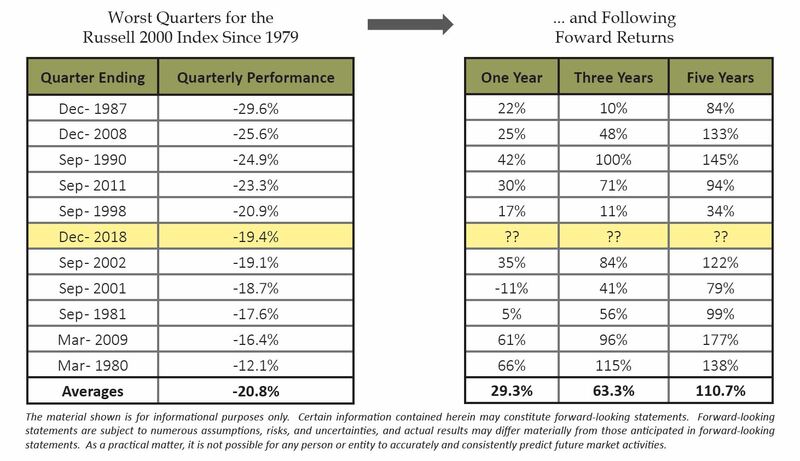 Nine out of the ten one-year periods saw a recovery with the average return of better than 31%. All of the returns were positive for the three year period following these corrections. The average return five years later was more than 100%. Large company indices reflected similar results. Many investors are sitting and examining their losses right now, hoping that things bounce back. You have probably heard that “hope is not a strategy.” This may be true, but while we can offer no assurances, the history reflected above points out that probability is on the side of the long-term investor. And probability favors buying (or, at a minimum, holding) at a time like this. I have felt fear of losing my net worth and my livelihood many times in my 35 year career. Fear is a natural human emotion, and nobody can be expected to be devoid of it. Education, experience, and discipline have taught me not to do what my fears tell me I should…which is sometimes, “run for the hills.” To the contrary, we have learned to fight our own fears and to do the exact opposite. At Punch we measure fear as a contrarian indicator in order to evaluate when opportunity might exist. In surveys like the AAII Bull/Bear Index and the elevated level of discounts on Closed End Funds (see Income Strategy article below), we are observing significant levels of fear on the part of individual investors right now. This is good for the buyer of some of the securities they are dumping. Bad investors tend to extrapolate everything that is temporarily bad and ignore everything that is permanently good. I have a neighbor who is from India and works here in a high level technology position for a local bank. He told me recently that our U.S. economy is the most entrepreneurial, innovative, and flexible in the world. He feels blessed to live here and be part of our system. As far as our economy goes, I believe things are better than the headlines might indicate. Our banks are in great shape, we have low unemployment, low inflation, corporations which are growing and, with lower corporate taxes, they have more money to distribute to shareholders. We are not macroeconomists at Punch, but we talk to CFOs and CEOs of small- and medium-sized companies every day. There seems to be a disconnect between what we read on the front page of the Wall Street Journal and what we are hearing from the leaders of the companies we own. In this economy, we tend to believe the people who are operating businesses where the rubber meets the road. I have no idea what the coming weeks and months are going to look like for the markets. Whatever the markets bring, we will steadfastly do what we always do on your behalf: focus on identifying solid businesses run by committed management teams and attempting to purchase interests in these businesses at prices low enough to allow for imprecise outcomes. What makes our team “uncautiously optimistic” isn’t that we believe stocks are going start heading up quickly, rather we are uncautiously optimistic because we are finding these opportunities in greater abundance than we have found in several years. Closed-end funds suffered a disappointing decline in the fourth quarter of 2018, with an index that tracks them down 9.5% (better than the S&P 500’s decline of 13.5% but worse than the High Yield Bond Index, down 4.4%). Historically speaking, the last quarter of the year is generally the worst for this asset class, and 2018 was no exception. For all but one of the closed-end funds in the Punch Income Strategy, the declines in share prices outpaced the declines of the assets in the funds themselves (which are marked-to-market daily), meaning that discounts widened to extreme levels. This phenomenon can happen during periods of market stress as prices dislocate from underlying value. In a recent Barron’s article dated December 21, 2018, author Randall Forsyth observed that we haven’t seen this level of panicky selling and discounted valuations on closed-end funds since the great financial crisis of 2008-09. Forsyth pointed out that it turned out to be a “marvelous buying opportunity.” At one point during the declines in December, closed-end funds traded within 1% of their all-time cheapest discount levels. Many funds traded at 15-20% discounts late in December—levels they had not seen in a decade, if ever. Dividend yields on some funds also reached well into the double-digits. In the fourth quarter, we added to positions in six existing closed-end funds in the Punch Income Strategy and added one new fund, a term trust that will liquidate in 2022. This fund traded at an 11% discount at its widest point and sported a 7.5% dividend yield. Looking closely at the history of closed-end funds, it is interesting that there does appear to be some seasonality in returns (see nearby chart). Since 2010, the average return on these funds in the fourth calendar quarter is a measly 0.6%, with four of the nine quarters being negative. The first calendar quarter, however, has produced a median return of 3.7%, with only one negative period. The reason for this seasonality, we believe, is largely related to year-end tax-loss selling by investors looking to reduce their tax bills by realizing losses before the turn of the calendar. In a year like 2018 when markets were already volatile at year end, tax-loss selling can have an outsized impact on the market for shares. If history is any guide, the disappointing performance in the second half of 2018 may be setting up for a rebound in the first half of 2019. This is a period when closed-end funds do seasonally better as this selling pressure abates and discounts return to more normal levels. There is an old investing adage that we would adapt for today’s market environment. Instead of, “Markets take the stairs up and the elevator down,” we think it should say, “Markets take the escalator up and the express elevator down.” Stock price movement in the market today tends to be large and exaggerated. Over the last two years, depending on the period measured, volatility has either been enormous or non-existent. We’re dealing with extremes. The nearby chart shows what an unusual year 2017 was with the Volatility Index (VIX) nearly flat for most of the year, while the S&P 500 Index marched upward at a steady pace. The following year, 2018, came with some significant (but short-lived) volatility, offset by periods of relatively low stock price movement. In terms of stock market performance, 2017 saw an astonishing lack of downside volatility in stocks, while 2018 was a reminder that downside volatility is a natural part of investing in risk assets. Given the rise in high frequency trading, algorithms, and passive investing, the kind of volatility seen in 2018 is unlikely to go away soon, in our opinion. While algorithmic trading is likely not the cause of the December selloff, it probably exacerbated market movements. Recency bias is the tendency to more easily remember something that has just happened compared to something that happened in the more distant past. The year 2017 was a period of record low volatility, and it’s understandable that a year like this might be followed by a year of increased volatility. However, recency bias can lead us to think that the past is prologue and to assume markets would deliver continued low volatility. Many investors likely assumed as much heading into 2018 with the memory of the previous year’s low volatility fresh in their minds. Investing is hard, and, you could argue, it’s getting harder. When we consider the volatility in the fourth quarter of 2018, it’s hard not to think the sky is falling. This is especially easy to do if we compare 2017 to 2018, because recency bias can complicate our thinking. It’s not “different this time,” it’s just volatility. Volatility is cyclical, and the cycle will continue. The year 2018 came to a close with headlines like, “Dow, S&P 500 post worst December since 1931…” and, “The stock market just booked its ugliest Christmas Eve plunge – ever.” Media market commentary is often filled with hyperbole and should be taken with a grain of salt, or even better, completely ignored. The media can create unnecessary fear. So what does that mean for our strategies? It means we’ll have to be more disciplined than ever. It means we’ll have to maintain our patience. It’s long been said that it’s not about timing the market, it’s about time in the market. We’re here to help you through the peaks and the troughs. Going into the fourth quarter of 2018, the Russell 2000 Index of small cap companies was up 11.5% for the year—a healthy gain for only nine months. By the end of the quarter, however, that same index was down 11.0% on the year. The small cap market that seemed so immune to trade wars and rising interest rates early in the year suddenly become quite vulnerable. From its peak on August 31st, the Russell 2000 Index fell 22.1%, significantly more than the peak-to-trough decline in the S&P 500 Index of only 13.0%. 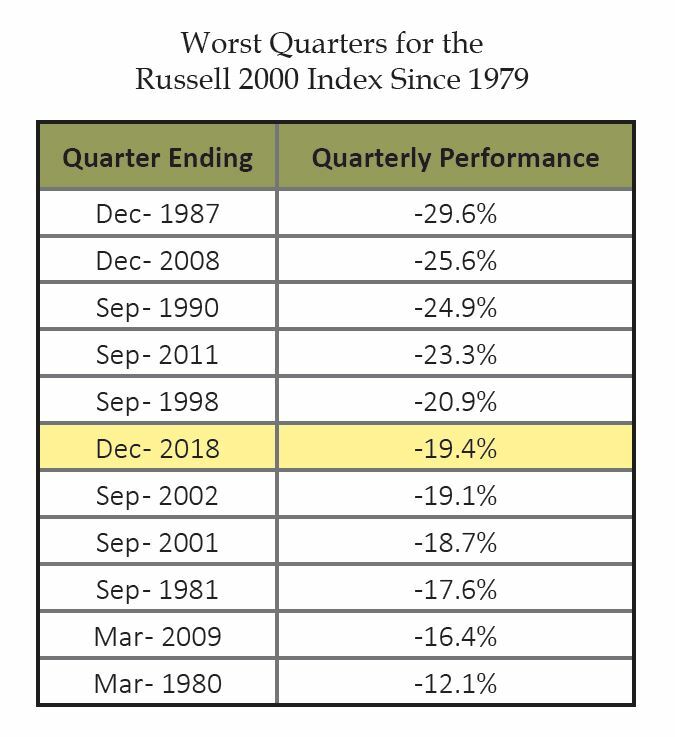 It is interesting to note that, while the Russell 2000 Index has produced an annual return of 12% over the past decade, it has experienced five distinct market declines of 20% or more (2009, 2010, 2011, 2015, and 2018). Statistically speaking, the small cap market generally sees a decline of 10% or more once per year, and 20% or more once every two to three years. In the context of history, this decline does not appear particularly unusual. While we chose against adding new stocks to the portfolio in the third quarter, we added a couple of holdings in the fourth quarter because we believe their prices had become unhinged from their long-term value. In November, we added a business development company to the portfolio whose assets were largely cash and whose price was at a meaningful discount to its cash-heavy net asset value (NAV). Following a change in management and investment strategy last year, we believe that the company could increase its dividend meaningfully in the years to come, and that its price should move closer to NAV over time. In December, we added a Houston-based energy company to the portfolio after meeting with the management at their Texas headquarters. Owing to a recent spin-off, a concentrated shareholder base, and no analyst coverage, we believe that that market is materially undervaluing the assets and growth potential of the company. As a vote of confidence, the company has been repurchasing a significant amount of its own stock. We exited a couple of long-term holdings in the quarter to fund these new purchases. The first was a snack-food maker that had been in the portfolio since 2007. The second was a Connecticut-based bank that we had owned since 2015 when it converted from a mutual holding company to a publicly-traded commercial bank. We believe that market volatility can present opportunities to the long-term investor, and in times like these, we are paying special attention to where the dislocations are happening. Emotion ticks up when markets get volatile. We see this from time to time when our clients’ intellectual curiosity spikes about what they own in their portfolio after the price of an investment has declined. As prices are rising, investors are often content to leave things alone, but in times of uncertainty and market volatility, investors become more interested in what these companies do, what products they sell, how much debt they have, the stability of their dividend, or their profit margins. We cannot predict the economy, much less the vagaries of the markets, and market prognostication is not a part of our method. Instead, we tailor an investment mix uniquely for your needs and invest in quality enterprises at times when their prices seem compressed. In periods of market volatility, we should not fixate on how the markets are behaving when what matters most is how we’re behaving as investors. For example, if you’re trying to lose weight, you won’t move the needle by staring at the scale. Instead, you’re better off focusing on your nutrition and your exercise plan. In the same vein, we cannot control the markets, but we can control how we respond to them, or, sometimes more importantly, how we do not respond. Attempting to focus on that which you cannot control could lead to insanity, and we would rather not preside over market-induced insanity. It’s best to focus on our behavior, and stop listening to the noise. Remember your purpose for investing. ✓ Avoid volatile investments earmarked as emergency funds or for short-term needs. For long term goals, you may be able to take advantage of the market’s fluctuation. Ask yourself when you will need this money, and remind yourself of its purpose. Align your behavior and investments with your goals. ✓ Examine areas in which you may need to make adjustments to spending (if any). With respect to withdrawals, “needs” can be addressed with a fixed dollar withdrawal, and “wants” can be addressed with variable withdrawals (or not for a period of time). ✓ If you have flexibility in terms of timing of any cash needs, take advantage of that flexibility and delay major expenditures or withdrawals in periods of downward volatility. “Value time,” don’t market time. ✓ Timing the market is a loser’s game. Simply put, you risk more harm (permanent impairment of investments) than you might do good. Because we do not possess clairvoyance, we do not let the market’s fluctuation dictate our investment decisions. ✓ We are, by contrast, “value timers.” This means that whenever the market affords us the ability to accumulate high quality assets at lower and lower prices, we’re inclined to do so. ✓ Volatility is normal and inevitable, and rash, emotional decisions in response to volatility are rarely in your best interest. ✓ Investing should not be exciting. Rather, a properly coordinated, long range investment plan should be sensible, methodical, and predictable. ✓ Avoid the temptation to react. Take your time, think things through, and talk to us. ✓ Make sure your financial decisions are in line with your goals and your purpose, and that your decisions are consistent with your long-range plan. ✓ Turn off the news. This act alone could add years to your life. ✓ Keep a journal. If it helps, write down your emotions and how you’re inclined to react to certain events. Often, your initial instinct does not serve you best. We keep a journal as professional investors, because it is important to keep our own emotions in check. Work with an advisor you know and trust. ✓ Know—and remember—the difference between “first-level” and “second-level” thinking. First level thinking looks for inputs that are simple, easy, and instinctual. This is like the “sugar high” of headlines and news (which change—sometimes dramatically—by the day). Howard Marks, Chairman of Oaktree Capital Management, L.P., said in his memo dated September 9, 2015, “First-level thinking is simplistic and superficial, and just about everyone can do it (a bad sign for anything involving an attempt at superiority). All the first-level thinker needs is an opinion about the future, as in, ‘The outlook for the company is favorable, meaning the stock will go up.’ Second-level thinking is deep, complex and convoluted.” Second-level thinkers process their thoughts in terms of interactions, time, and system dynamics, and this becomes important once you get past the headlines. ✓ An astute advisor will remind you to take advantage of volatility and make changes that were not previously possible (i.e. a prohibitive tax consequence to selling a legacy position with a large imbedded taxable gain). ✓ Take this opportunity to re-examine your overall estate and wealth transfer plan. Are there any loose ends or attractive opportunities? Consider funding certain kinds of trusts with assets at compressed valuations. You may be able to save your family gift and estate taxes upon recovery and allow benefits to accrue to future generations. ✓ A trusted confidant will help you remember your purpose for investing and that volatility is a normal part of the process. 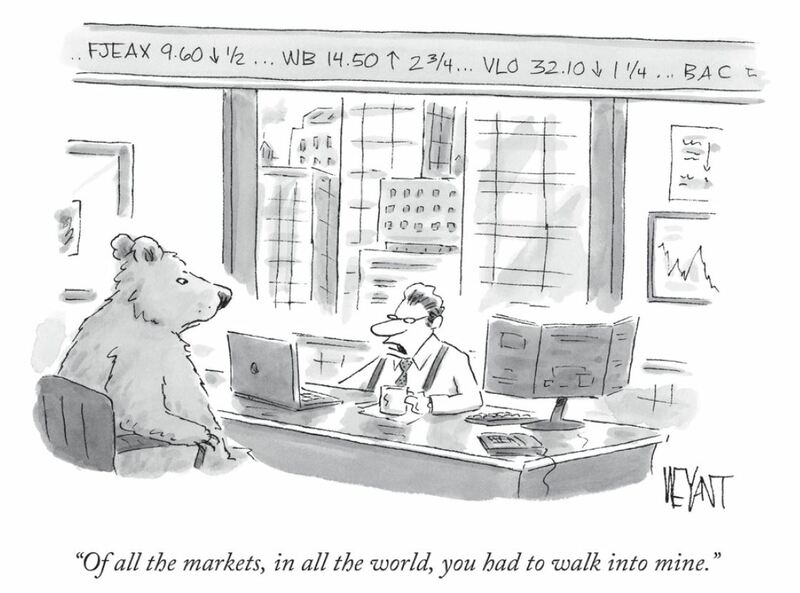 We have already budgeted for this volatility in your long-range plan. ✓ create an overall, holistic financial and estate plan that speaks to their needs, the needs of their family or any other people they want to support, and also address charitable objectives with clarity and precision. Over the past several weeks, we have had many conversations with our valued, long time clients. Some are inclined to back away, not invest when they were otherwise planning to do so, or, in general, develop a sudden aversion to risk assets. Still, others have had the instinct to “lean in” to this volatility, recognizing that, as prices get cheaper they represent a better value for the same assets as compared to just a few short months ago. In an informal audit of investor returns over time, we’ve found that those investors who maintain the discipline to counter their initial fears and respond in perhaps the opposite manner than what the media is advising tend to have better results over time. Whether it’s having the discipline to stick to your investment plan or having the willingness to invest further into a volatile market, your behavior matters. The truth is, if you know what you own (we do), and you have a philosophy and a discipline that is time tested (we do), the most volatile investments tend to produce the highest returns over time. This fact has not been repealed even by this market. A difference in annual returns of just 2.5% per year over ten years equates to a 28% cumulative difference over 10 years. As co-investors alongside you, our reality is that we need to accept some volatility from time to time to enjoy better long term returns. The key is to take advantage of this volatility and not be victimized by it. In homage to the esteemed Vice Chairman of Berkshire Hathaway, Charlie Munger (who turned 95 last month—Happy Birthday, Charlie! ), we remember one of our favorite quotes of his regarding investing: “It’s not supposed to be easy. Anyone who finds it easy is stupid.” Your behavior has everything to do with your end result. In closing, dear client, Punch is still working with the first client we signed up in 1985 which we believe speaks meaningfully to our client retention, and over half of our clients have entrusted their investments to our group for over ten years. Over the years, we’ve established many good habits together which have led to sustained, positive results. Don’t let extreme volatility from one quarter entice you to make permanent changes to your thoughtfully designed investment plan. Let’s continue to work together toward your goals. We’re grateful for your trust and our personal relationship with you. Punch & Associates is registered as an investment adviser with the U.S. Securities and Exchange Commission. Registration as an investment adviser does not imply a certain level of skill or training. The information disclosed is intended to provide potential options we understand may be available to you and should not be construed as accounting, legal, or tax advice. Whether any or all of these options could be available or benefit you can only be determined following the advice of a qualified attorney and your tax advisor. Punch & Associates is not a law firm or accounting firm, and none of our associates are practicing attorneys or tax professionals. As such, we advise you to seek qualified counsel before making any legal decision. The material shown is for informational purposes only. Certain information contained herein may constitute forward-looking statements. Forward-looking statements are subject to numerous assumptions, risks, and uncertainties, and actual results may differ materially from those anticipated in forward-looking statements. As a practical matter, it is not possible for any person or entity to accurately and consistently predict future market activities. Some information may have been provided by or compiled based on information provided by third party sources. Although Punch & Associates believes the sources are reliable, it has not independently verified any such information and makes no representations or warranties as to the accuracy, timeliness, or completeness of such information.